He said that on 25 May, the Irish people gave a clear message for the legislation of abortion services in Ireland. "Today we begin the job they have given us, of making the law that follows the repeal of the Eighth Amendment and after 35 years in our Constitution, in doing so, we are also making history," he said. The minister said history was made in the streets, in homes and in ballot boxes across the country by people, including politicians, who had campaigned "steadfastly for years". He also noted the role of young people in the campaign. Mr Harris said the referendum was a resounding affirmation and respect of support for women and their right to make choices about their lives. "It was a reaffirmation of the primacy of equality in our modern democracy and it was also a call for us to do more," he said. "More on women's health, women's equality, more on continuing to shape an inclusive and equal society." The minister said he was determined that today would see a new chapter on women's health. 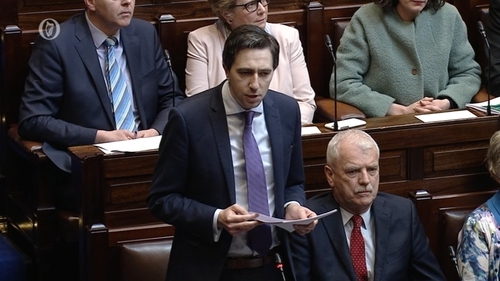 Fianna Fáil's health spokesperson told the house that the people of Ireland voted on the heads of the bill, which was published prior to the referendum on the Eighth Amendment. Stephen Donnelly said politicians therefore needed to question whether proposed amendments put to the bill fell within the particular parameters of the heads of the bill. Mr Donnelly said there were aspects of the legislation that he did not agree with, including the three-day waiting period. However, he said in his view it formed part of what the Irish people voted for and on that basis confirmed his support for its inclusion. A Sinn Féin TD noted that criminal sanctions were located at the back of the general scheme of the bill, but have been moved to the front of Regulation of the Termination of Pregnancy Bill. The party's health spokesperson, Louise O'Reilly, said this would create a chilling effect on the medical profession and surmised that it was the re-writing of the Eighth Amendment into the legislation. She asked for the criminal sanction to be moved to the back. Ms O'Reilly also noted that the word abortion was not in the bill before the Oireachtas. Labour's Alan Kelly said it was "unfortunate" that the offences were at the front of the bill, saying the fact it was the first thing that will be read had unintended consequences. The Labour health spokesperson called for "absolute clarity" regarding the legislation, but also said he was concerned about meeting the 1 January 2019 deadline for introducing abortion services. Solidarity/People Before Profit TD Ruth Coppinger said she disagreed with other TDs when they suggested that the bill should not be changed following the referendum. She argued that the scale of the result and the turnout showed that Ireland should be taking a more liberal direction regarding the legislation. Ms Coppinger described the 72-hour waiting period as unnecessary and said it would impinge on lower economic classes. A number of TDs also highlighted concerns of the LGTBI community and their inclusion in the legislation. The Independents 4 Change TD, Joan Collins, echoed concerns by Sinn Féin and Solidarity over the exclusion of intersex, transgender, and other gender identities that are able to become pregnant from the legislation. She proposed a recommendation by Amnesty, that instead of the word woman, the legislation would make reference to a pregnant person of age. Mattie McGrath said the legislation would "trample over sincerely held beliefs of doctors". The Independent Rural TD told the Dáil that 75% of 936 registered GPs who took part in a recent online survey were opposed to taking part in abortion services. However, despite this, he said the Minister for Health was intent in "bulldozing it along". Social Democrats co-leader Catherine Murphy said that following a mandate that overwhelmingly sought to remove the stigma and criminalisation of women, it was "a shame" that the first half of the bill was "entirely preoccupied" with offences and penalties that may be faced. She said: "This is not the environment we want our practitioners to operate in." The deputy leader of the Green Party expressed concern over the three-day waiting period in relation to women in Northern Ireland who may seek a termination in the Republic of Ireland. Catherine Martin asked how access to abortion services would be feasible for women if two appointments with a doctor may be required. "This doesn't represent a feasible option to many, given the time required and the expense of travel," she said.